A place to share my yarn creations. I thought my email address was finally synced in with my phone...I must figure out technology! Meet Binky's newest friend, Boggle the Gumdrop (not destroyer!) Monster! Once again, I copied this pattern straight from my tumblr account. There seems to be more crafters on blogger so maybe I will post my patterns here and more picture on tumblr. Or maybe I'll abandon my tumblr completely? I'm not sure yet. I wish I could figure out how to add more pages to my blog. I FINALLY figured out how to switch my email account on here. I'll be sure to get to your comments now! Insert safety eyes 6 stitches apart between rounds 6 and 7. Stuff head completely. Continue stuffing until the end. F/O. Leave tail. Do not stuff. F/O. Leave long tail. Stuff firmly. 1. Find the outside corners of the stitches 2 rounds below each eye. These are marked in red. 2. Using your tapestry needle and black embroidery thread, thread through from the right red point to the left red point. 3. Pull thread through. Make sure to leave a long tail on the right. Poke needle back into the right point. 4. Bring needle through the outside of the stitch closest to the left point. Make sure that the needle goes only half way up the edge. 5. Pull the needle and thread through, and place the needle back into the left point. 6. Poke the needle any where in the back or side of your work. Tie a knot as close to your work as possible. 7. Cut the tail off making sure not to cut off the knot. Stuff into the work. 8. Thread the tail that is connected to the right point through the eye of your tapestry needle. Poke the needle on the outside of the stitch closest to the right point. Now that the face is finished. You can sew the arms and feet on. I highly recommend pinning your pieces to the body before sewing them on. For my Binkys, I pinned the arms off to the sides of round 13. I pinned the feet off to the sides of round 20. After the sewing is finished. Binky is complete! Hope you enjoy the pattern. ^^ Feel free to leave me a comment and/or message me if you find something wrong with the pattern. Please remember that you may not sell this pattern. Because Binky was not designed by me, you may not sell finished products made from this pattern. Thanks for your understanding. First, thank you so much for your continuous support. It means so much to me, and I love seeing your creations! Many outside sources that have my patterns in their database direct everyone to this blog, so I will keep this blog up just in case. I will also continue to post basic patterns here, but you can find detailed patterns with pictures on my tumblr. I know this is late, but I was trying to figure out where I put the post it with the notes for this pattern. Finally found it! I hope the instructions for the face is easy enough to follow! 1.This pattern is made by joining each round. To do this slip stitch into the beginning stitch then ch 1. Continue pattern accordingly. 2. To change colors, I also recommend using the jogless color change technique. Here is a tutorial for it if you need help ^^. Face/Body: With F Hook. Start with orange. Rnd 8: *inc, 6 sc* (48) Switch to white after this round. With the needle point canvas, cut out 2 circles the size of your work so far. This is to keep the face and back relatively flat. Rnd 12: *sc* (60) Switch to light blue after this round. F/O and weave in tail. Place one of the circles you made from the needle point canvas inside the body against the face. Stuff. Bottom: With F hook. In white. F/O and leave long tail to sew to body. With the right side out, line the stitches of the bottom to the open side of the body. Begin to sew the pieces together. Make sure you make the needle go through both loops of the body and the back loops only of the bottom. When your work is about half way closed, slip the other needle point canvas circle inside and against the bottom piece. Finish sewing the work together making sure to add more stuffing if needed. "Feet": Make 4 With D hook and white yarn. Rnd 3-4: *sc* (12) Stuff at the end of round 4. F/O. Use a tapestry needle to thread the tail through the last round to close the hole. "Legs": Make 4. With D hook and white yarn. Ch 5. Make sure the tail is long to you can sew this end to your work. F/O leaving long tail. Roll the piece into a tube, and stitch the tube together using the tail. 1. Eyes: These are made from black felt. They are circles with a diameter of 4 rounds of the face. 2. Mouth: This is made from red felt. Cut out a "V" shape that is 8 rounds of the face tall. Curve off the point of the "V". Fold The mouth together length wise and cut a half circle on the straight side. 3. Glue the mouth to the face making sure that the tip of the top of the mouth is touching the center of the 1st round. Glue the eyes on both sides of the face. 4. You can embroider the black outline of the mouth, but I just glued black embroidery thread around the border and cut out a thin "m" shape with black felt for the grin. 1. Using one tail, sew each tube to a ball. Use the other tail to sew the legs to the white yarn on the sides of the body. Weave in ends. Please visit their blogs, there are great things each of them share! And now for my 5 random facts. 1. I study a lot! If I'm not crocheting, I'm going over some form of biology notes. 2. My user name, HanakoHeals, was my main character from an MMORPG called Lineage II. She was a healer. 3. I've attended a private Catholic school all my life until college. I actually miss my uniform and small classes! 5. I really wish I knew how to draw. I think I'd be able to create cuter amigurumi if I had the skill! I've been hesitant to post these patterns because when I make them over again, I've always had to adjust the pattern. For example, the stripes on the great ball usually have to be changed in length depending on how much the ball is stuffed. The love ball's heart is also not crocheted but cut out of felt and back stitched together. I decided to post these patterns up to give you a general idea of how they were made, but you might have to adjust parts of the pattern. **= anything in between is repeated. This part is made by joining each round. To do this slip stitch into the beginning stitch then ch 1. Continue pattern accordingly. Rnd 7-9: *sc* (36) Switch to black in the last stitch of round 9. Rnd 10: *sc* (36) Switch to white in last stitch. Rnd 13: *dec, 4 sc* (30) Begin to stuff at the end of this round and continue stuffing to the end. Button: With D hook. Worked in rounds. Do not join. -Using the white button's tail, sew the white button to the black button. -Using the black button's tail, sew the button onto the back stripe of the pokeball. Follow the pattern for the pokeball, but exchange the red yarn for purple. -Sew the spots on each side of the masterball. You may stuff lightly, but the extra round of sc should make the spots puff up on its own. - I recommend embroidering on the "M" with white embroidery thread for more durability, but I cut out an "M" from white felt and glued it onto the the masterball between the 2 spots and above the button. Follow the pattern for the pokeball, but exchange the red yarn for blue. -Sew stripes to each side of the great ball with the button inbetween. 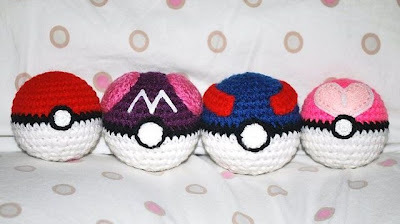 Follow the pattern for the pokeball, but exchange the red yarn for purple. Do not sew the button to the ball yet. -Cut out a heart using white felt, and cut a smaller heart using pink felt. -Attach the pink heart to the white heart whichever way you choose. I sewed them together using a back stitch. -Embroider a white line down the center of the hearts with white yarn or embroidery thread. -Attach heart to the love ball whichever way you choose. I glued mine on with a hot glue gun. Make sure the tip of the heart is touching the center black stripe. -Sew the button to the center of the love ball and on top of the heart's tip. That's it! I hope these guide lines help you. Feel free to ask me any questions. Please do not sell this pattern or products made from these patterns without my permission. Thanks. Hi everyone. 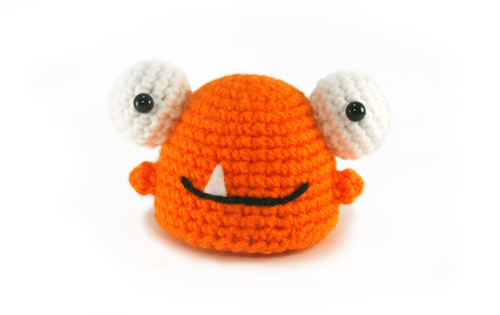 My name is Justine aka Hanako and this blog was made specifically for my amigurumi endeavors. Please do not claim patterns that I post as your own. I also ask that you do not sell finished products without my permission. Thanks!